Alexander parked his boats in the winter of 333 BC in Antalya and when Spring of 332 BC was sprung, he started north from Perge to Gordium. For more than two thousand years Alexander the Great has excited the imagination of people around the globe. 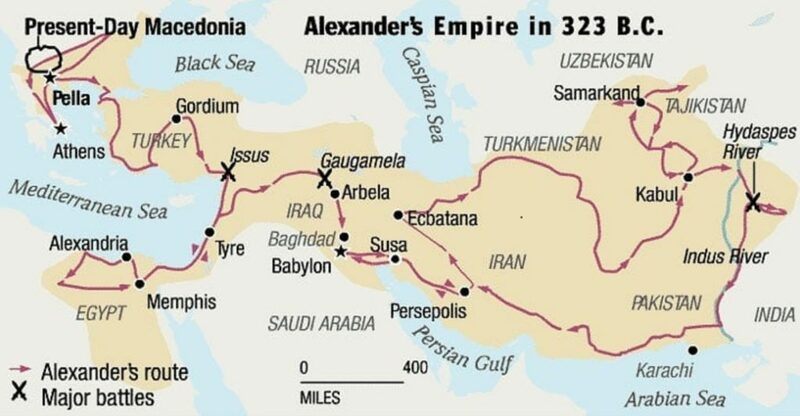 I became fascinated by Alexander some 18 years ago when a history teacher at school unraveled a map of the classical world and traced the outline of his journey with his finger. Who could not be intrigued by a man who inspired his soldiers to march for 12 years, beyond the known ends of the earth. They tramped some 22,000 miles; from Greece all the way to India and back to Babylon. By the time the Macedonian king died at the age of thirty two in 323 BC much of the known world lay beneath his feet. Having studied his campaign in libraries I wanted to get out on the ground and see how the landscape with its mountains, rivers, and deserts shaped his strategies and determined his route. Geography so often governs history, and I wanted to see it up close for myself. I decided to organise an expedition focusing on Turkey, ancient Asia Minor, retracing his footsteps from the enigmatic city of Troy to the site of the Battle of Issus. What better way than to walk the 2,000 miles, travelling at the marching speed of his army and experience something of the physical rigours he faced. I wanted to behold the monumental ruins of cities he visited or attacked, and to search for ancient roads, upon which his soldiers trekked. It took Alexander and his 40,000 soldiers eighteen months to reach Issus. I would refrain from fighting battles, besieging towns, and the occasional spot of pillaging, and so hoped to complete the route in some twenty weeks, covering about fifteen miles a day. Turkey is a veritable treasure trove for those enthralled by Alexander. First stop should be Istanbul’s magnificent archaeological museum. There, pride of place, stands the Alexander sarcophagus. This was not Alexander’s personal coffin, the whereabouts of which has been hotly debated. Instead this tomb was excavated at Sidon and probably belonged to Abdalonymus, a mere gardener who was appointed as the local ruler by Alexander. In death as in life he wanted to show his continuing respect for his overlord, and so had Alexander depicted on his tomb. To marvel properly at one of the finest pieces of craftmanship from the ancient world you really do have to drop to your knees. Carved in lustrous white marble, the sides are adorned with reliefs of battles and hunts charged with energy and grace. If one looks carefully, it’s possible to see the remnants of painted colours that highlighted the figures all the more, and the tiny holes where once tiny spears and swords were carefully positioned. One side shows Alexander at the hunt, a popular pastime amongst the Macedonian nobility and one of Alexander’s favourite pleasures. On another is Alexander the Great at war, astride his trusty steed Bucephalas, rearing up on muscular legs above a fallen Persian horseman. The king himself, his head encased in a lion helmet, symbol of Hercules, stretches his right arm back over his shoulder with spear at the ready. It was in the spring of 334BC that Alexander embarked on his epic expedition to overthrow the Persian empire. As he sailed from the Gallipoli peninsula across the Hellespont, the modern Dardanelles, he stopped mid way to sacrifice a bull and pour libations from a golden cup to placate Poseidon and the ocean. Then, dressed in full armour at the prow of the royal trireme, always a king with a showman’s instincts, he hurled his spear into the soil claiming the continent as his, won by right of conquest. Needless to say he was the first to jump from his ship and set foot on the sands of Asia. When I visited Troy the start-point of my walk, I felt rather like many travelers first exploring the site, confused and a little disappointed. There are no great colonnaded streets decked with marbles and mosaics to inspire awe, instead you have to let your imagination fly and let ancient myths consume your thoughts. This is what Alexander did almost immediately after arriving in Asia Minor. He stripped naked, anointed himself with oil, and ran to place a garland on the tomb of Achilles. It was a symbolic gesture, the new great warrior paying homage to his own personal hero, who had fought a thousand years before Alexander (if there is any truth in Homer’s story of the Trojan war). Next, having climbed up to the temple of Athena, he donated his own suit of armour and was given in return the finest relics from heroic times, including Achilles’ celebrated five layer shield, which was to save Alexander’s life during a siege in India. My walk began in March and as I walked inland I shivered my way through hills decked in snow. Thankfully welcoming villagers were on hand calling me into their tea houses, plying me with hot cocoa, and presenting me with a cornucopia of tasty treats. Heading south having already worn out one pair of boots, I reached Ephesus. While Troy requires a leap of faith, this city needs no effort at all to bring its ruins to life. Although almost all of what can be seen today is Roman, dating to the time when the city was the capital of the province of Asia, it was an important city hundreds of years before when Alexander the Great marched through. In Alexander’s wake I visited the Temple of Artemis, one of the seven ancient wonders of the world. Coincidentally it was burned down by a madman the night that Alexander was born. Nowadays the temple stands forlorn and melancholy. Just one column rises full above the swampy ground. It’s hard at first to see in the sparse ruins one of the greatest buildings ever built, but the sheer length of it offers the first easy clue. Since so many buildings in antiquity were frequently damaged then rebuilt, or in a state of construction for centuries, I find it quite refreshing to see a celebrated temple left plain and unreconstructed. Alexander offered to defray all the costs that had been incurred in the rebuilding of the temple on the proviso that they would dedicate it in his name, but the citizens of Ephesus politely declined his attempt at PR and propaganda ‘because it did not befit one god to do honor to another’. Not far south, however, he found a far more willing recipient for his largess. The town of Priene, always a poor cousin to Ephesus, was only too glad to take his cash and allow him to dedicate their new temple to Athena. Today Priene stands like a veritable time capsule to the Hellenistic period following the death of Alexander the Great. Designed on a rigid Hippodamian grid square pattern, named after the architect from nearby Miletus, the stepped streets march up the steep hillside almost oblivious of the geography, to Athena’s temple. Standing here, looking out on a breathtaking panorama high above the vast alluvial plain of the Maeander River, the passage of time is instantly obvious. 2,300 years ago, all the land below was sea. Islands which were once witness to great naval battles are now mere bumps in a seemingly endless flat. Yet strolling around Priene, almost always empty of tourists, it’s almost possible to hear the marching feet of Macedonian soldiers amongst the sound of cicadas. Heading further south, Alexander reached Halicarnassus, the glistening capital of the Hecatomnid dynasty, built on a lavish scale by Mausolus, whose tomb, the ‘Mausoleum’, was ranked as one of the seven wonders of the ancient world. It was also a key naval base occupied by the Persians, who manned the city’s 6.5kms of fortifications. These giant walls, bristling with towers, were a technological masterpiece and only a few decades old. They still snake their way over the hillsides above Bodrum. One can get a real sense of their majesty at the Myndos gate on the west, which stands well preserved and resolute not far from a newly built supermarket. As big and strong as they were, Halicarnassus’ walls were built to defend in a bygone age. For Alexander was equipped with a new type of weapon, the torsion catapult. Designed by engineers at the court of Philip, his father, it was powered by animal sinews that could unleash far more power than anything previously seen. Until then siege warfare had generally been a case of surrounding a town and starving it out. Now a new arms race had begun. With these catapults Alexander could actually knock down walls, and literally smash any cities that stood in his way. One can almost imagine the look on the faces of the Persian generals, encamped in Mausolus’ old palace probably beneath the city’s Crusadar castle, as Alexander’s troops wheeled up siege towers several stories high, and let rip the first volley of stone boulders. Three months into my expedition, I walked through the depths of central Anatolia, a never-ending patchwork of wheat fields, to the city of Gordium. Situated on the Persian Royal Road just west of Ankara, this was the capital of Phrygia, a kingdom founded by Gordius in the 8th century BC. It was expanded by his celebrated son, Midas, whose touch according to legend turned everything to gold. It was here that one of the most celebrated moments in Alexander’s career occurred. Alexander was attracted by the story surrounding a ceremonial chariot that marked Gordius’ grave. The wagon’s yoke was attached by a knot no man had ever been able to undo. Not unlike the story of Arthur and the sword in the stone, people believed that whoever undid the knot would become Lord of all Asia. Surrounded by a crowd of onlookers Alexander struggled to loose the knot. Growing frustrated he drew his sword and slashed through it. Apparently Zeus himself approved of Alexander’s actions, for “there were thunderclaps and flashes of lightning that very night”. In the baking heat of August, I headed southeast via Cappadocia, across the Taurus mountains, and on past Tarsus. Where the coast of Turkey turns south to the east of Adana, a great mound lies, excavated in recent times. This earthen ‘huyuk’, like many scattered around this part of the world, marks an ancient settlement, in this case, the town of Issus. It was here that Alexander left his sick and injured soldiers before moving south hot on the trail of the Persian Great King, Darius. Unbeknownst to Alexander, however, Darius’s army was actually wheeling around behind him. When Darius reached Issus, he cut off the hands of the Macedonian sick he found there. Today the area is far removed from its ancient past, an industrial zone crammed with smoking factories. But it was here that one of the most significant battles in history was fought. On the banks of a small river, Alexander assembled his force. He had chosen the site carefully, a narrow plain hemmed between mountains and sea, to prevent the Persians from using their vastly greater numbers. I remember walking around the area, armed with the ancient writers who described the battle, trying to make sense of the landscape. It is a telling insight into the nature and personality of this legendary figure. My walk finished just a few miles south of the site of the battle at the city of Iskenderun, named after a city Alexander founded here in commemoration of the battle. Four and a half months and 2,000 miles after setting off on foot from Troy, I could not believe my journey had finished. The myriad ancient cities I had seen were embedded in my memory, but what remains foremost in my mind is the sincere friendship of the Turkish people, extended constantly to a weary traveller far from home. Every single day I was welcomed into their homes and showered with kindness and hospitality. Though just a brief affair, it was passionate in the extreme, and left me madly in love with the land that is Turkey.